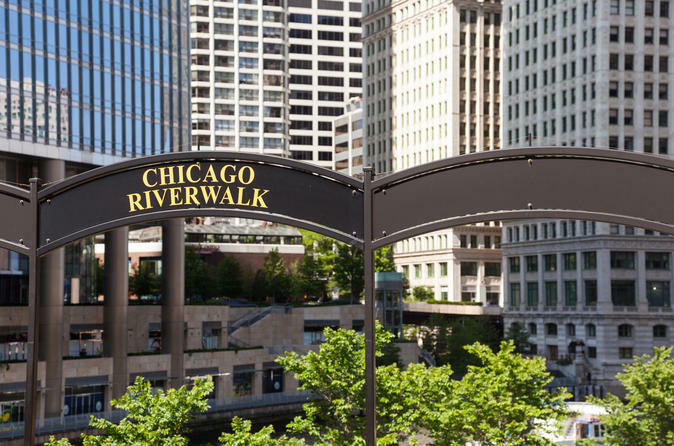 The recently expanded River Walk is Chicago's newest hot spot and beautiful pedestrian walkway that follows the Chicago River as it flows through downtown. It is one of the best ways to discover the Windy City. On this 2 hour walking tour including short boat ride, guests hear riveting tales about the "Second City" and what makes Chicago truly unique. To keep things exciting, a 15-minute water taxi trip and ongoing trivia challenges will make this a walking tour one to remember! Completed in October, 2016, the Chicago River Walk is one of the Windy City’s most exciting new additions. On this 2 hour tour including 15 minute boat ride, held every day of the week at 2:00 pm, you’ll have the chance see the best of this scenic, riverside walkway, from its stylish new restaurants to its pretty green spaces and other relaxed attractions. As you go, learn about Chicago’s unique history, encounter its iconic skyscrapers and other architectural highlights, and even take a break in the form of a water taxi ride. The tour begins at 2:00pm sharp at Peet's Coffee & Tea - Wrigley Building Plaza - across from Walgreen's - 400 North Michigan Avenue. After a short boat ride, guests will be told riveting stories about Chicago’s history, architecture, and place in popular culture. After a brief introduction, your guide will immerse you a riveting tale of the city's greatest tragedy in terms of lives lost - S.S. Eastland Disaster. Guests will view architectural gems, ranging from the Marina City towers and Lyric Opera House to the Mather Tower and River Point, and hear more fascinating episodes from Chicago’s history. As you wander, you’ll also have the chance to play some entertaining trivia games — pay attention, as multiple prizes are awarded throughout the tour. The tour concludes at the River Theater on the River Walk - Clark & Wacker Street Intersection.